Blessed assurance, Jesus is mine! Oh what a foretaste of Glory Devine! Heir of salvation, purchase of God. Born of his Spirit washed in his blood. This is my story, this is my song, praising my Savior all the day long!! I just LOVE this song! It takes me back to Lakeview Assembly of God Church. Sitting on the third pew from the front, on the left side of the church, with the youth group. I vividly recall sitting between Pebo Thomas and Sheldon Parmer, singing this song after the pastor said, “turn with me to page 44 in the Hymns of Glorious Praise!”. Or standing in the alto section of the choir by my dear friend Ginger Woods. Those are wonderful memories, of wonderful days that helped to shape me into the woman I am today. I will be forever grateful to Rev. Kenneth Woods and Rev. Phil Edwards for laying down the foundation on which I now stand. I am so Thankful for their years of service and sacrifice! What made me think of this you ask? Well, I made some of Caleb’s favorite cookies today for him to share with his class. Before the cookies made their way to the classroom, they made a pitstop in the the school office, where two very special ladies, Tracy Wagner and Mindy Ellis keep the school running smoothly on a daily basis. When the cookies ended up on their desk for safe keeping they were each given one as payment for keeping them safe until time for the party. As I entered the office later that day, they began to express their love for these AMAZING, WONDERFUL, and FAVORITE cookies and asked me for the recipe. 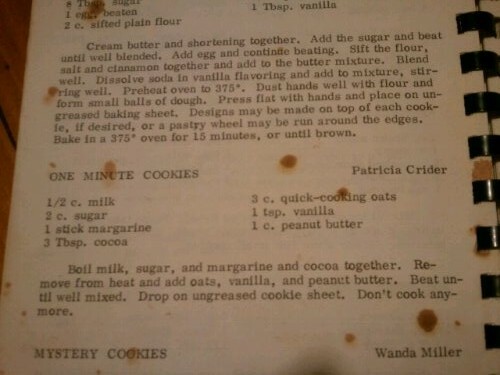 I was only too happy to put the recipe for, One minute cookies (or no bake cookies) on here for all to enjoy. So how does the song, Blessed Assurance, fit into a post about cookies? Well, this classic recipe comes from a cookbook that was given to me on my wedding day….entitled, Blessed Assurance Cookbook. Compiled by the women of East Salem Baptist Church in Leakesville, Ms. Page 88 to be exact! This cookbook has been used so much, it opens up automatically to page 88 and is splattered with chocolate from years and years of use. These cookies are so easy, I am almost embarrassed to accept any credit for making them. They really do stand on their own and ANYONE can make them. There is only one tricky part to making these cookies……the stove top cooking time…..only one minute! If you cook them too long they will turn out dry and crumbly. If you under-cook them they will be soft and gooey. So, if you cook them for one minute you should have perfect cookies as a result. 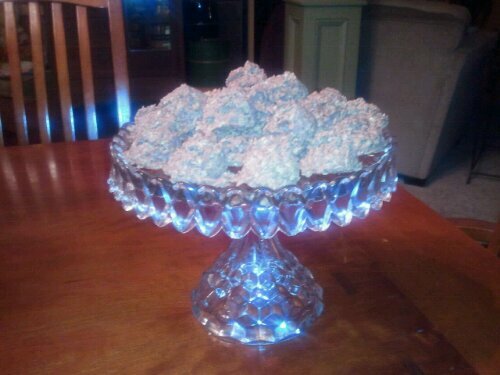 Give this recipe a try and you can take credit for making an AMAZING and WONDERFUL cookie too! In a large pot, mix the milk, sugar, butter, and cocoa together. Bring to a full boil and boil for one minute. Remove from heat and add oats, vanilla and peanut butter. Mix well and quickly drop by spoonful onto a sheet of aluminum foil (I use a cookie scoop). These will set up in just a few minutes…..and….their done! I so enjoy your writings … the recipes are just a bonus. thanx for sharing so much with so many. Tonya, I’ve made these cookies for 30 years; however, I have never added vanilla — wasn’t in my recipe, and I use a 1/4 cup of cocoa powder, which may be about the same as 3 tablespoons. They are delicious, and I haven’t made them in awhile — maybe today!